Making Pumpkin Muffins is a delicious way to use the abundance of pumpkins available in the fall. You can bake a pumpkin, let it cool, remove the pumpkin peel with a sharp knife and then purée the pumpkin pieces in a food processor (and then strain or drain the pumpkin through cheesecloth before using in baking). This is a lot of work but if you want fresh pumpkin for your cooking (breads, soups, pies, cakes, tarts or as a side dish) you should use a Sugar Pie, or Sugar Baby, or Autumn Gold, or Prize Winner or Triple Treat pumpkin rather than the large common pumpkin we buy for making Jack-o'-lanterns for Halloween. Most often the smaller pumpkins will be more tender and somewhat more sweet than the large varieties. You can also roast pumpkin seeds on a cookie sheet in your oven at a low temperature and eat the roasted seeds as a snack. Shelled pumpkin seeds can be used in place of pine nuts in recipes. But as I said, all this is a lot of work. 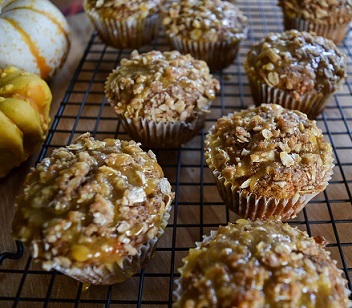 This muffin recipe takes the easy way out - it calls for canned pumpkin. If you make your own puree you can use an equal amount of it in place of the canned pumpkin. 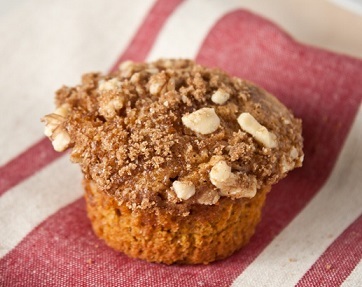 This Pumpkin Nut Muffin Recipe will give you moist and delicious muffins. And as a bonus, pumpkin is a great source of vitamin A. Preparation time: 20 minutes. Serves 12-16. Tip: If a recipe calls for sifting several dry ingredients, put all the ingredients in a bowl and stir with a wire whisk. That's GREAT! You now have some wonderful muffins to share! 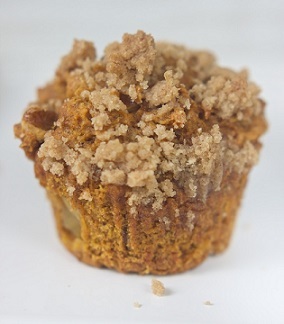 Enjoy your Pumpkin Muffins and the company of those you share them with! Did you know? LIBBY’S 100% Pure Pumpkin is all-natural and contains no preservatives. The pumpkin goes from seed to can right here in the USA.